A culinary adventure was had by a fearless foursome from the ‘burbs. We ventured out of The Bubble down to the Montrose area of H-town, where tattoo parlors and antique shops compete with clothing resale boutiques and enough restaurants to fulfill date nights for months. 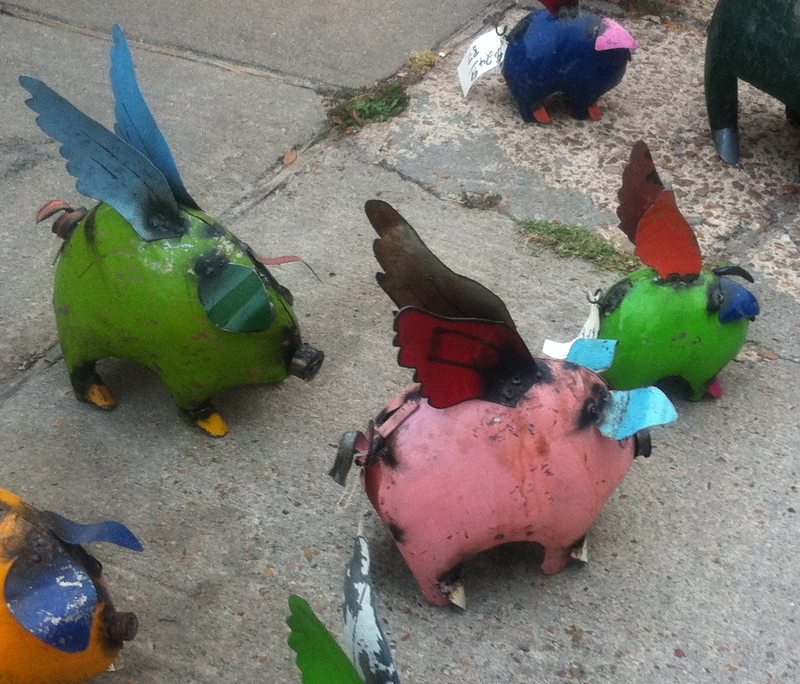 Walking from our car we passed by BJ Oldies Antiques, and I was taken with the herd of colorful, metal, winged pigs. 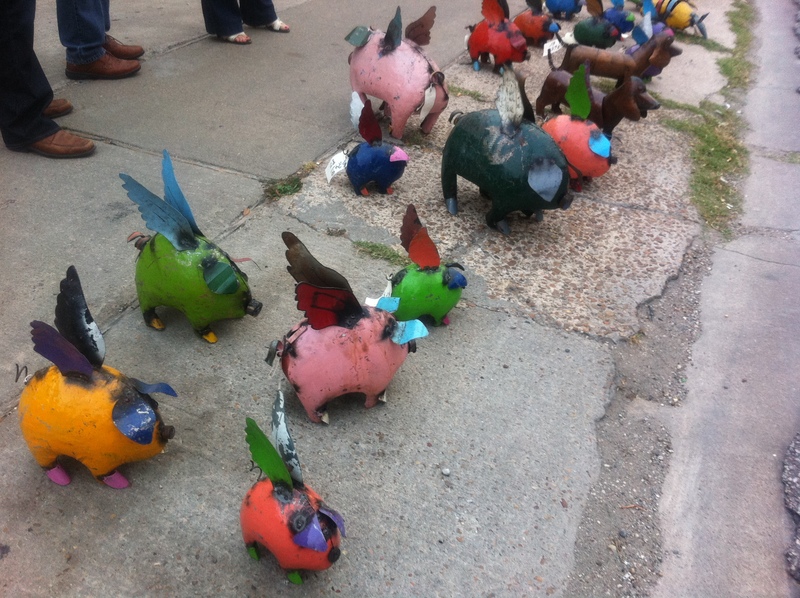 Because the herd was congregated so close to Westheimer, a busy main road, I didn’t get a very good shot but suffice to say the pig-loving girl in my house needs one of these. She wants a green one, so now the only question is big or small? 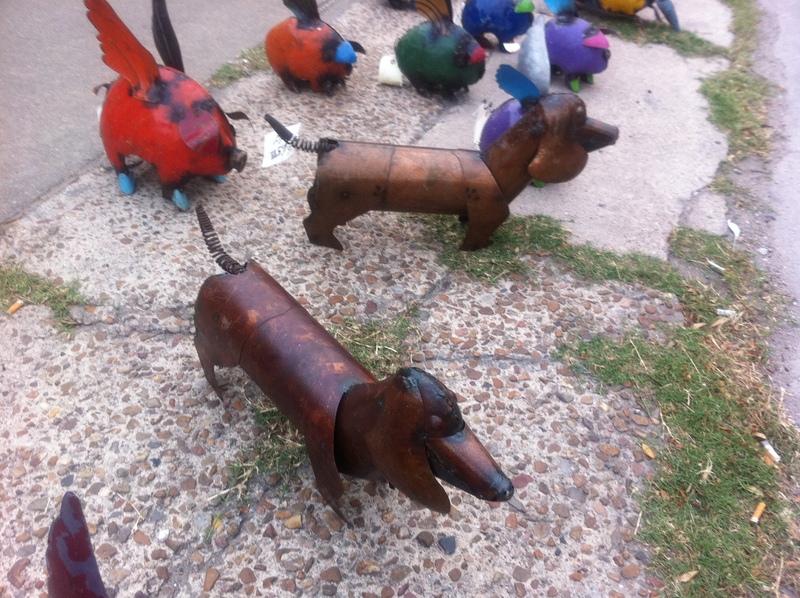 I may have to bring home a weenie dog for myself. I’ve always wanted a weenie dog. Instead I got a weasel dog. Charming as they were, we didn’t leave The Bubble to shop for yard art. We had a reservation at Feast Rustic European Fare. Fans of The Travel Channel’s “Man vs Food” show would love this restaurant. Not because of the huge portions but because of the utter strangeness of it. Feast is a crazy experience. It’s been described by foodies, critics, and restaurant writers in glowing terms. Allison Cook, food critic for The Houston Chronicle said Feast is “less like eating at a restaurant than going to the home of a friend who was an inspired cook. And who happens to live on a farm.” The New York Times said that Feast has “no real peer in New York, Chicago, Los Angeles and other major cities that pride themselves on their epicurean adventurousness.” The Food Network’s “Outrageous Food” has filmed an episode at Feast. I can certainly see why. It’s a vegetarian’s nightmare, by the way. I survived the meal, and enjoyed what I ate, but was afraid to peruse the menu too intently, and I needed horse blinders to avoid seeing the carnage on other diners’ plates. The chalkboard touting the evening’s specials listed Rabbit Skeleton. For real. As in, something people would willingly order and eat. The menu changes daily, and instead of a laminated booklet it’s a piece of paper. Mine had some grease stains on it, and I soon learned why. There is some weird stuff on that menu. And Trevor ordered two of the weirder items: Warm Fat on Toast as a starter (yes, that is for real), and Bath Chaps. More on that in a sec. Our waitress, Jody, began her spiel about the evening specials, both of which involved rabbit, and I literally plugged my ears. Unfortunately, the man at the table next to us ordered the Rabbit Skeleton, hence the need for horse blinders. Clever marketers that they are, Feast does have some non-meat options, in which I gratefully found refuge. 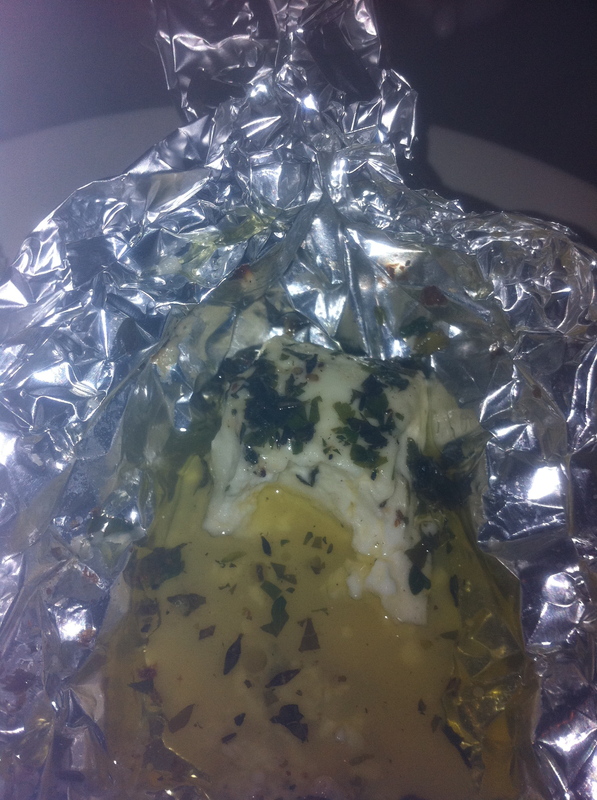 The Feta Parcel was amazing: a rectangle of salty, briny feta doused in herbs and a mysterious yet delicious liquid, wrapped in foil then baked to almost-creamy proportion, served on ultra-crispy thick toast. That, along with the champagne cocktail and house bread, could make a mighty fine meal for me. However, there was more to come, as we shared each other’s starters. Well, I shared the ones that were safe for a non-meat-eater, which meant Jill’s Mulligatawny Soup. One word: yum. I gave Keith’s Black Pudding, Peas, Mint and a Fried Egg a miss, along with Trevor’s Warm Fat on Toast. Luckily, no one at our table ordered the Deviled Chicken Bones. While repulsed, I am curious about whether people actually eat the bones. I have a vision of a dog getting into the trash and horking up a shard of chicken bone that’s lodged in his throat. I expected the Warm Fat on Toast to be like butter or lard, but it was cubed and slightly chunky. I neither tasted nor smelled it. One glance was enough for me. Trevor, however, was much more fond of this dish than I. We were all intrigued by the Anchovies with Clotted Cream on Toast (lots of toast being served at Feast). After Jody hyped this dish, we capitulated and were rewarded with a crostini of sorts with a thick layer of clotted cream and a single, whole anchovy atop its lush bed. Perfect combination of salty, crunchy, and creamy. On to the entrees! Mine was the Panade of Mushrooms, Fennel and Leeks. I read a lot about food, and yet was unfamiliar with the term “panade.” Always glad to learn something new, and dangerously close to not finding an entree because of my fear of looking too closely at the menu, I was happy that Jody recommended this dish. It’s a big bowl of mushrooms, fennel, and leeks, as promised, bathed in a thin yet substantial sauce with melted and broiled cheese on top. The whole bowl goes in the oven and it was super hot. Yummy, but heavy. I’m used to my vegetarian fare being a little lighter. Most of the panade remained in the bowl. Jill shared a bite of her whole Amberjack cooked in paper, which was delicious. I’m glad she gave me a tidy bite and I didn’t have to deal with the bones. Enough with the skeletons. And then there was the Bath Chaps with Garlic Rutabaga and Swiss Chard. Trevor and Keith both chose this entree, and neither one finished. In fact, they could have easily shared one and still been thrown into a Fat Coma. I’ve lived all of my almost-42 years without ever coming across bath chaps. 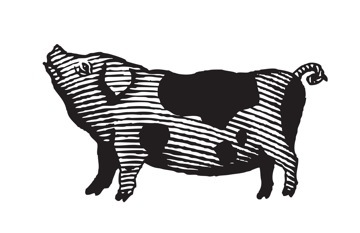 It’s basically the lower cheeks and jowl of a long-jawed pig that is cured like bacon. 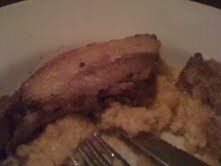 This dish also had something to do with the pig’s tongue as well, although I tried to avoid taking in those details. Of the pork cheeks, it’s been said that “It’s as if the best carnitas and the best pork belly got married and had a baby,” and as much as I like babies, I avoided this one like the plague. The amount of animal fat in this dish must have been staggering, because Trevor and Keith are both consummate carnivores, and both left copious amounts of cheek, jowl, and tongue in their bowls. While apparently very flavorful, it’s also very filling, and I shuddered to think at the effect on one’s digestive system. In fact, I predicted that such a meal would make one *%$# one’s brains out. Trevor was so stuffed he couldn’t even fit in an after-dinner drink at Anvil, the hipster bar we stopped into and had to seek refreshment from a bottle of Pelligrino. Even then, he woke up feeling hung over, but not from booze. The Fat Coma has lingering effects. 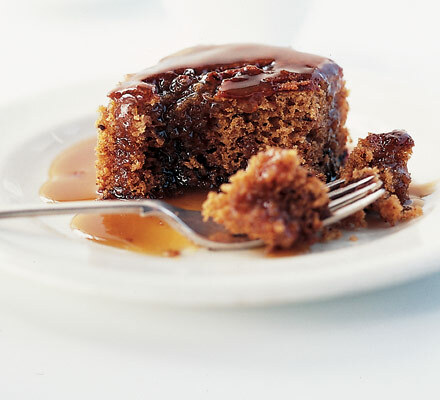 No one needed a single thing beyond the dregs of the French red blend we were drinking, but we ordered a Sticky Toffee Pudding with Clotted Cream and 4 forks, because we figured a visit to Feast wouldn’t be complete without a thorough stuffing of one’s gut. The few bites I had were swoon-inducing: buttery, brown-sugary, moist, and magical. Feast was not only a feast but also an adventure. The fearless foursome all agreed it was worth leaving The Bubble to experience this crazy place. No comment on the “feast” (I’ll just stick to my burger & fries, thanks), but we have one of those metal pigs (I chose an un-winged one) as well as a goat and a chicken. Interesting photo. 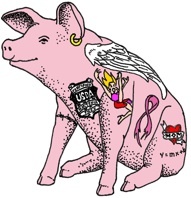 The phrase “when pigs fly” comes to mind. I love the pigs and the weenie dogs!!! !